We Offer Great Perks for Our Hotel's Guests in Beatrice. 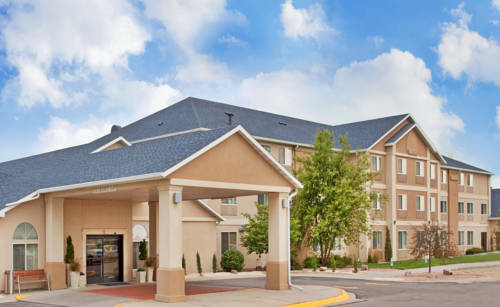 Our smoke-free Holiday Inn Express� Beatrice hotel is located 40 miles south of Lincoln on Hwy 77. Unlike many other hotels in Beatrice, Nebraska, we offer tons of great amenities to our patrons, and we are just minutes away from the best attractions our small town has to offer. If you are traveling here on business, we can help make working out of the office easier. Complimentary high-speed, wireless Internet access and over 3,800 square foot of meeting space allow you to accomplish all of your goals without ever leaving the hotel's site. Beatrice, Nebraska is home to a number of nearby businesses, including Exmark, Koch Nitrogen, Beatrice Bakery, StoreKraft and NEAPCO. Staying with us means you can enjoy choice amenities like a heated, indoor pool and a 24 hour Fitness Center. For our business guests, we offer a complimentary Manager's Reception Monday through Thursday from 5pm to 7pm, where there are free cocktails and hors d'�uvre. Make the smart choice and stay at the best hotel in Beatrice! Fine food and drink,casual attire, modest prices, elegant atmosphere. Full bar , extensive list of imported and domestic beers, fine wines: bottle and glass. At Back Alley Eatery, we season our meat with a light rub, smoke it to perfection and serve with barbecue sauces on the side for your individual taste. Our hotel features the finest meeting and reception facility in the region. We have 3,500 square feet of meeting and banquet space. Linens, bar and catering service, and a variety of Audio Visual equipment available. Children's program - Big Blue Water Park, 9,000 square feet of swimming and fun! Open Memorial Day thru Labor day from 12:00 noon to 8:00 PM. The Beatrice Country Club is located at 1301 Oak Street in Beatrice. The Country Club features a scenic 18 hole course along with a putting green, chipping green, practice bunker, driving range, lessons, rental clubs, rental carts and pull carts. Beatrice Speedway IMCA season racing runs from April through October. Teh Speedway features IMCA Modified, Pro Am, IMCA Stock Cars, Factory Stocks & IMCA Hobby Stock. Hidden Acres Golf Course offers 18 competitive holes of golf in a peaceful country setting. Our community college offers lots of courses on many different subjects. This local museum offers a variety of activites for the whole family. Many area businesses call Industrial park their home. We have three movie theaters here in town, which offer a wide variety of films. Local Community Theater at its finest. We have many beautiful parks here in Beatrice. A restored remnant of a World War II POW camp for Germans. Opened in 2015. Don't forget to sign the guest book. 56 feet tall, a huge replica of the tiny spike that marked the (supposed) completion of the transcontinental railroad in far-away Utah.